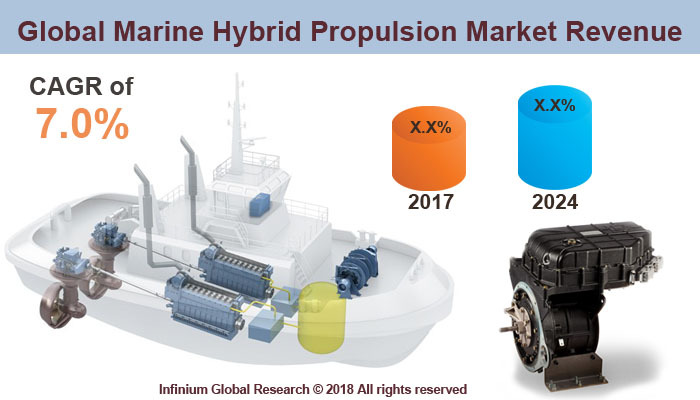 A recent report published by Infinium Global Research on marine hybrid propulsion market provides in-depth analysis of segments and sub-segments in global as well as regional marine hybrid propulsion market. The study also highlights the impact of drivers, restraints and macro indicators on the global and regional marine hybrid propulsion market over the short term as well as long term. The report is a comprehensive presentation of trends, forecast and dollar values of global marine hybrid propulsion market. According to the report the global marine hybrid propulsion market is projected to grow at a CAGR of 7.0% over the forecast period of 2018-2024. A hybrid vehicle can achieve propulsion using a fuelled power source for e.g. a diesel engine or through a stored energy source, which is a battery bank and electric motor. Hybrid propulsion systems can be differentiated between configurations, where the diesel engines and the E-motors work in parallel on the propeller. The main applications of marine hybrid propulsion market are in offshore vessels and navy applications. Offshore patrol ships are good examples of ships that are equipped with the hybrid propulsion system. Patrol ships can be operated at low speeds by the electric motor and at a high power demand by the main engine. Moreover, Anchor Handling Tug Supply vessels are good examples of offshore ships with highly flexible power demand and per consequence, different operation modes, and sailing speeds. Increasing trade of resources such as coal, crude oil, iron, and steel is done through large vessels. These large vessels containing high volume resources are driven through marine hybrid propulsion market. In addition, continuous development in the marine industry along with growing ship owner preferences for high fuel-efficient features are boosting the growth of the marine hybrid propulsion market. Furthermore, marine hybrid propulsion not only offers improved fuel efficiency but also adhere to stringent environmental regulations. The number of countries has adopted marine hybrid systems owing to the growing concerns about global warming caused because of fossil fuel. The system utilizes the unused capacity of the main diesel engine to generate electricity and store it in batteries for later use. This, in turn, has opened several doors of opportunity for the key players in the marine hybrid propulsion market over the upcoming years. On the other hand, increased the defense budget by various emerging economies, particularly for sea-based defense and maritime security and the gradual adoption of LNG over conventional marine fuels is expected to open new opportunities in the global marine hybrid propulsion market. Among the geographies, Europe dominated the marine hybrid propulsion market in terms of revenue followed by North America. The European Union has also supported the upgrade of ferries, as all vessels navigating through in European waters have to reduce sulfur emissions from 2015. The Asia Pacific is the most lucrative market for marine hybrid propulsion. The growth in the Asia Pacific region is due to the deployment of the advanced marine hybrid propulsion system in the newly built ships. On the other hand, the exchange of crude oil for the most part of the Middle East nations to Asia Pacific regions is another factor driving the growth of the Asia Pacific regions. The report on global marine hybrid propulsion market covers segments such as propulsion type, transport, power rating, end user, and application. On the basis of propulsion type, the global marine hybrid propulsion market is categorized into a diesel-electric, parallel hybrid, serial hybrid, full electric, gas turbine, and fuel cell. On the basis of transport, the global marine hybrid propulsion market is categorized into inland waterways, coastal/cross-border waterways, fishing vessels, ferries, tugboats, cruise, cargo ships, and defense vessels. On the basis of power rating, the global marine hybrid propulsion market is categorized into 0-300 kW, 301-500 kW, and 501-800 kW. On the basis of end user the global marine hybrid propulsion market is categorized into cruise ships, defense vessels, ferries, offshore support vessels, tugboats, and a yacht. On the basis of application, the global marine hybrid propulsion market is categorized into commercial, logistics, offshore drilling and naval. The report provides profiles of the companies in the global marine hybrid propulsion market such as Rolls-Royce Holdings plc, General Electric Company, Mitsubishi Heavy Industries Ltd, Caterpillar Inc, Hyundai Heavy Industries, MAN Diesel & Turbo, Niigata Power Systems, Yanmar, BAE Systems and Siemens AG. The report provides deep insights on demand forecasts, market trends, and micro and macro indicators. In addition, this report provides insights into the factors that are driving and restraining the global marine hybrid propulsion market. Moreover, IGR-Growth Matrix analysis given in the report brings insight into the investment areas that existing or new market players can consider. The report provides insights into the market using analytical tools such as Porter's five forces analysis and DRO analysis of marine hybrid propulsion market. Moreover, the study highlights current market trends and provides forecast from 2018-2024. We also have highlighted future trends in the marine hybrid propulsion market that will impact the demand during the forecast period. Moreover, the competitive analysis given in each regional market brings insight into the market share of the leading players. This report will help manufacturers, suppliers, and distributors of the marine hybrid propulsion market to understand the present and future trends in this market and formulate their strategies accordingly.